This excerpt from Issue #39 features an interview with actor John Pickard. Pickard met Nelson in the 1940s; he studied with Major Herbert Wall at the time Nelson was coaching with him, sang in the G.I. chorus and was in Nelson’s last film, Northwest Outpost. 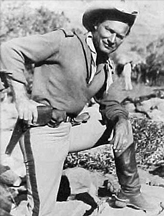 Pickard later starred in films like True Grit, The Lone Ranger, Rose Marie remake, and TV series such as Rawhide, How the West Was Won and Rin Tin Tin. Article and photo copyright ©1989, 2006, all rights reserved. John Pickard: I know that Nelson was in the Army Intelligence during the war. Northwest Outpost was not with Jeanette. I know very little about Jeanette because I didn’t know her as well as Nelson….I know they were very close. The main thing about Jeanette was that she was a lady, I mean, a real genuine lady. She was also temperamental. And he could be pretty temperamental at times too. Nobody has ever been able to understand why she married Gene Raymond, of course. You know the story about him? Sharon Rich: What about him? JP: I mean the fact that she came home and caught him in bed with a guy. This was not too long after they were married. SR: You know about that? JP: Oh, yeah. But why she married him in the first place even if he wasn’t bisexual—nobody could understand that. So people got the idea that it was because she and Nelson—it was hopeless for them, and they had nowhere to go, so she just caught something on the fly, so to speak. SR: So it wasn’t “a marriage made in heaven,” as the press claimed? JP: She filed for divorce. I remember that. I don’t know if they went through with it. But I definitely remember that, and the studio PR people were in on it, trying to calm it down and hush it up a bit. SR: She didn’t go through with it. JP: I heard about Jeanette and Gene breaking up again in the late 40s. Gene was on a picture, I can’t remember the name of it. It was fairly well known about Gene, from more or less the beginning…. [Nelson] was close to a singer named Gale Sherwood. You know about that? JP: They were very close. I knew Gale; she was with my agent at the time. I met her there. She was always popping into his house, saying, “Well, I’m going on the road again with Nelson.” Gale had a beautiful voice and was a very beautiful girl at one time. But she was sort of a funny girl in a way, you know, she’d just say, “Oh, screw the whole thing,” and that would be the end of it. She had to have a calming effect, and Nelson was that….She was quite a few years younger than he was. They had their ups and downs, and off and on. SR: Did Nelson seem like a happy man to you? JP: Well, yes, he did. He was kind of a shy man. He’d tell a story and just laugh and laugh…with a great musical laugh. Who really knows these people? You can’t really get to know them….One funny thing happened, many, many years before, when I was studying voice in Nashville with a guy named John Lewis….Nelson was giving a concert there at War Memorial. And of course all of Lewis’ students went to the concert, and were very anxious to know how Nelson acted, and what kind of man he was. Lewis met him briefly and spent a little time with him and said, “Well, he was in my studio, and vocalizing, but he turned his back on everybody because he didn’t want to show the fillings in his teeth.” I’ve never forgotten that. I know Nelson used to give expensive and elaborate gifts to people. Herbert Wall used to say, “My God, I can’t reciprocate here, the man gives me this and that, and I don’t have that kind of money.” And we used to say, “Take it and enjoy it.” I’ve heard about Nelson’s generosity, and also that he could be very tight with his money.